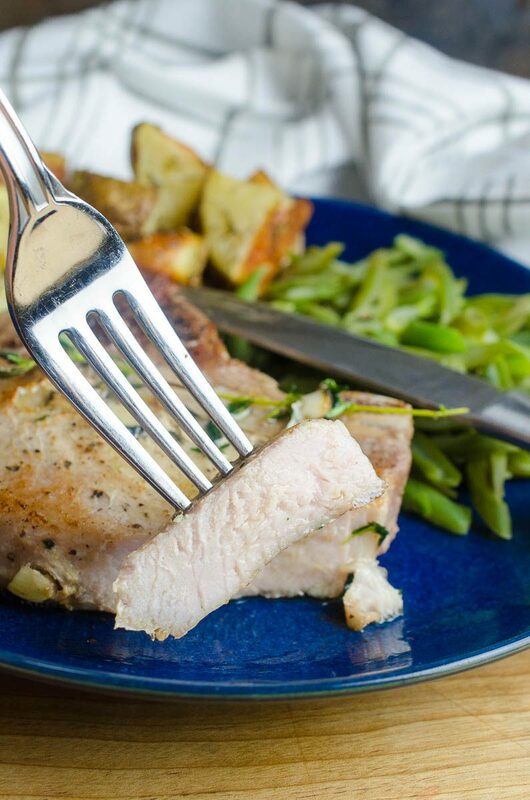 Want to learn how to make Sous Vide Pork Chops? 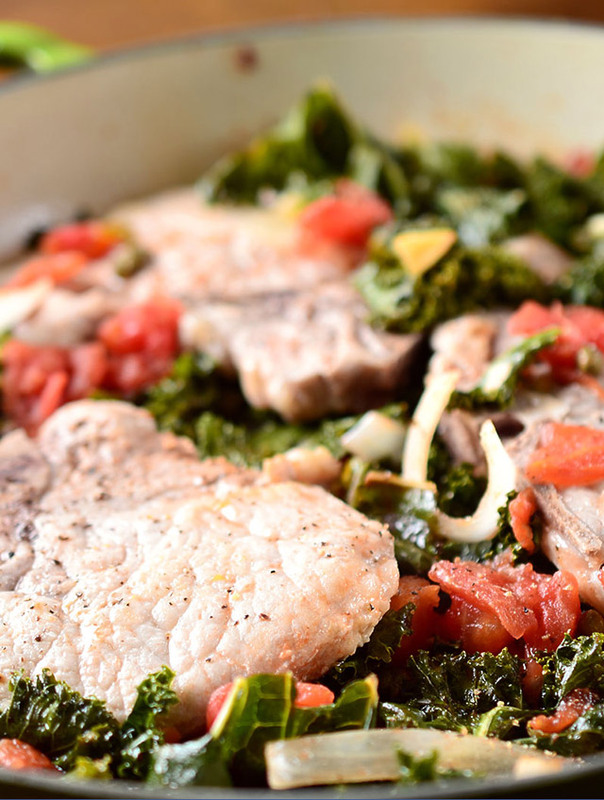 This easy to follow recipe yields juicy, flavorful pork chops that the whole family will love. When I realized that my Sous Vide Precision Cooker makes perfectly cooked steak every time, I couldn’t wait to try it with other proteins. Pork Chops were my next venture into the world of sous vide. 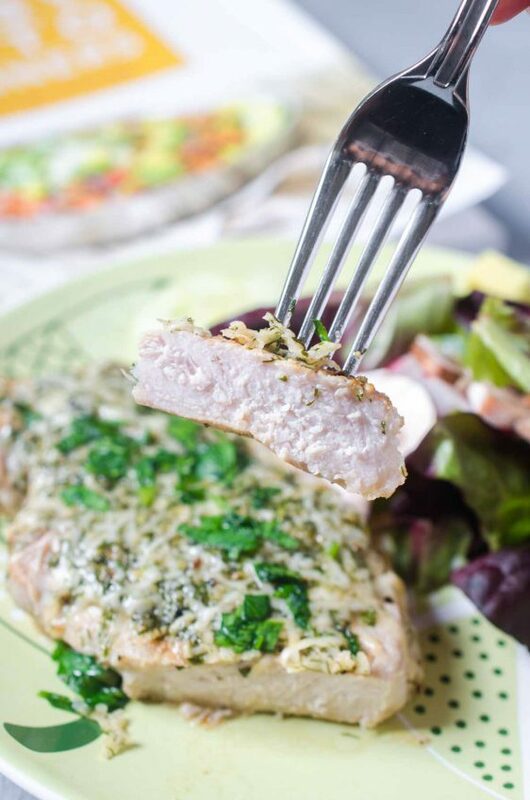 And just like the steak, sous vide pork chops are juicy, tender and oh so flavorful. 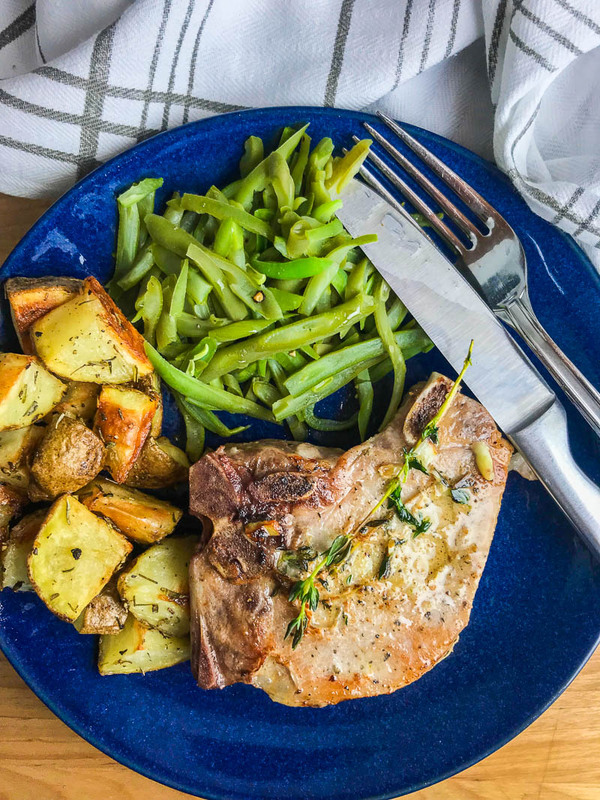 Served with some green beans and roasted red potatoes, made this a hearty, flavorful meal. Sous vide cooking is essentially placing food in a vacuum sealed bag and then cooking it in temperature controlled water. Sous vide cooking requires planning ahead because it takes more time. 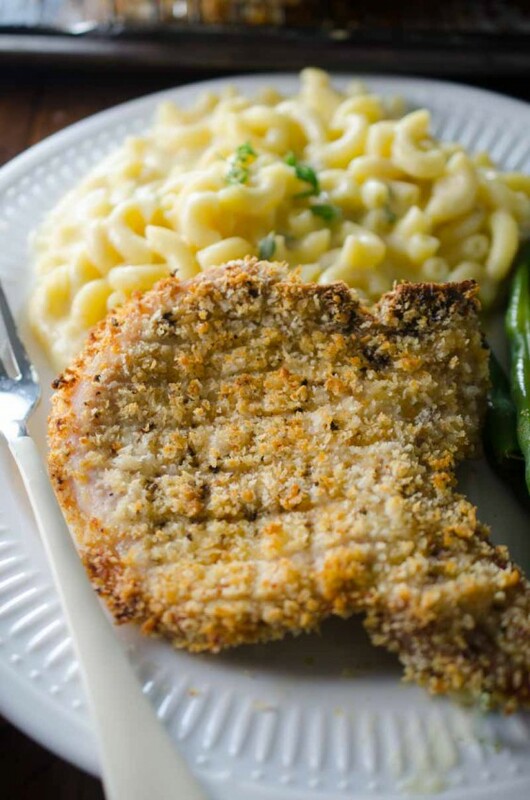 For example, for this sous vide pork chops recipe, you’ll need to cook the pork chops for 2 hours. It sounds like a lot but the pork chops will never get above the temperature you set, so no need to worry about them drying out. Since the food you are cooking is sealed, it won’t get the crispy brown exterior without a finishing step. 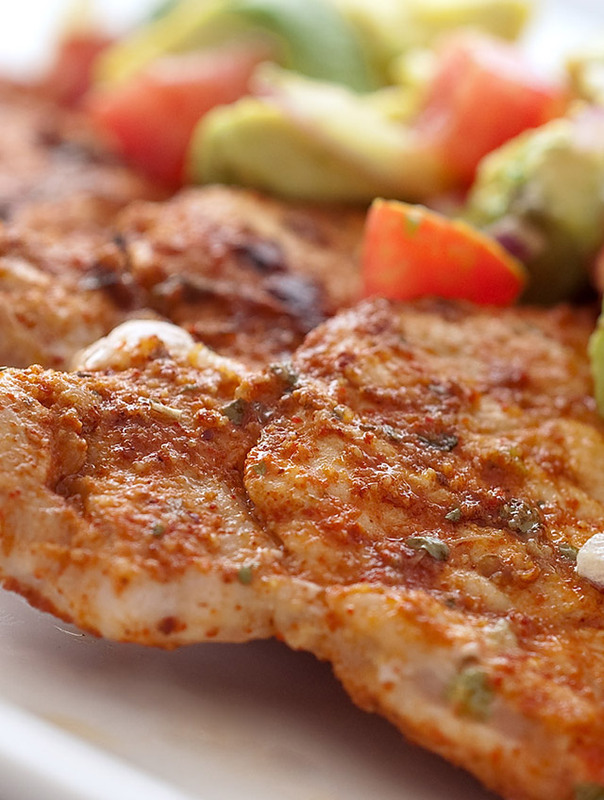 This can be a quick sear in a scorching hot pan or a minute or two on the grill. To learn a little bit more about all things sous vide, here is a good article from bon appetit. What is a sous vide circulator? For a long time, if you wanted to cook sous vide you’d need a big sous vide machine that takes up a lot of space. Now with Sous Vide Immersion Circulators, you can turn any pot into a sous vide machine and it is fabulous. I use the Anova Precision Cooker and have been really happy with it. Do you need a vacuum sealer to cook sous vide? Nope! If you’re just getting started, ziplock style bags will work just fine. 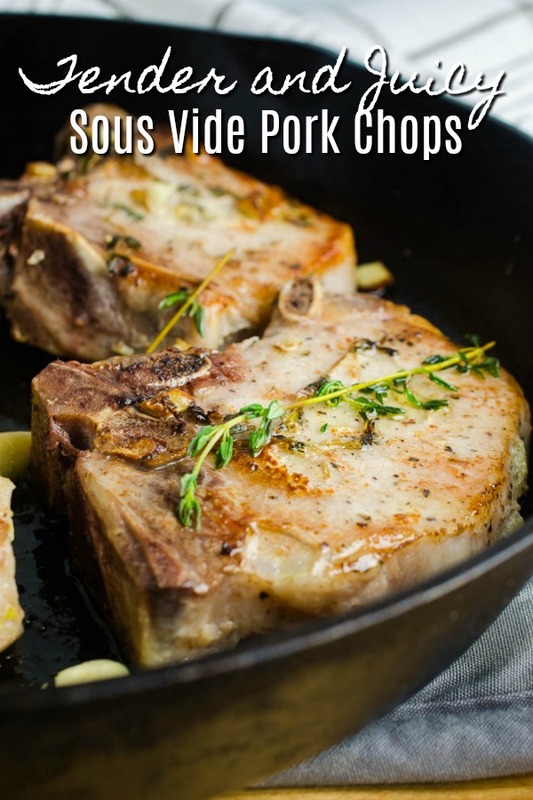 What kind of pork chops do you need to make sous vide pork chops? 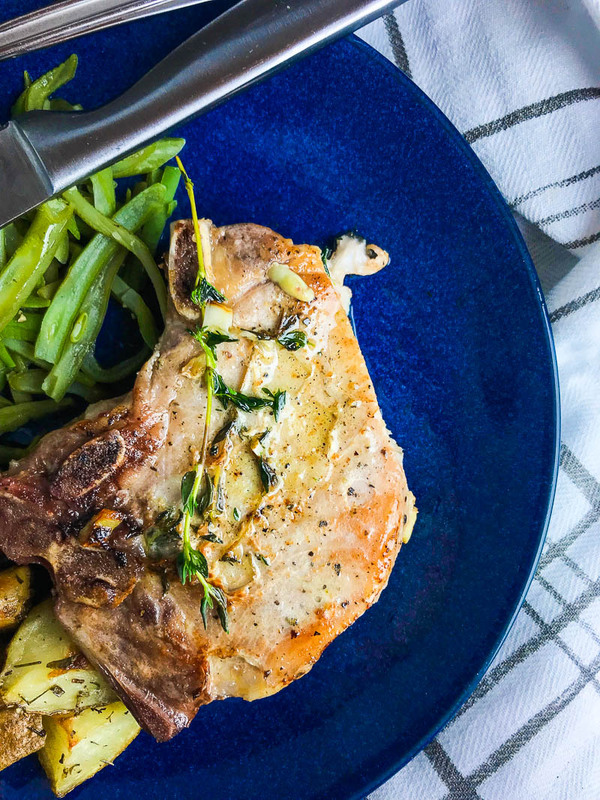 To get the perfect, juicy sous vide pork chop, you’ll want to buy thick cut bone-in pork chops. When I say thick cut, I mean about 1 – 1 1/2 inches thick. 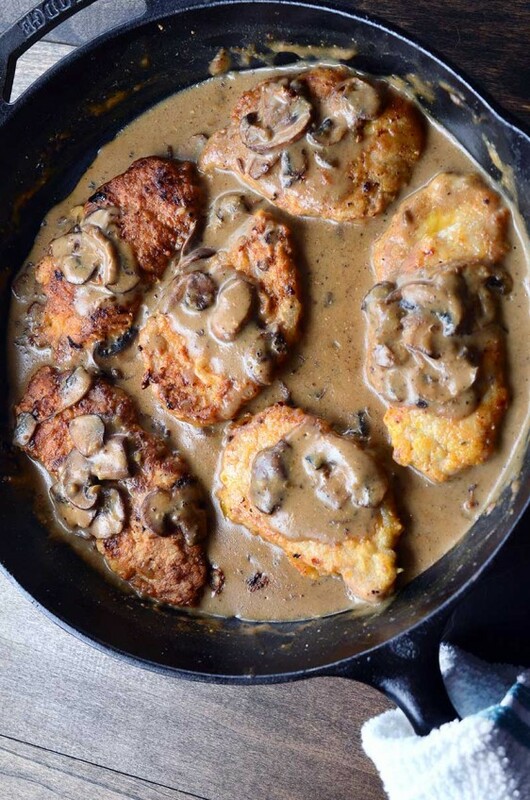 I’ve tried to make this recipe with the thinner pork chops and it didn’t work as well. 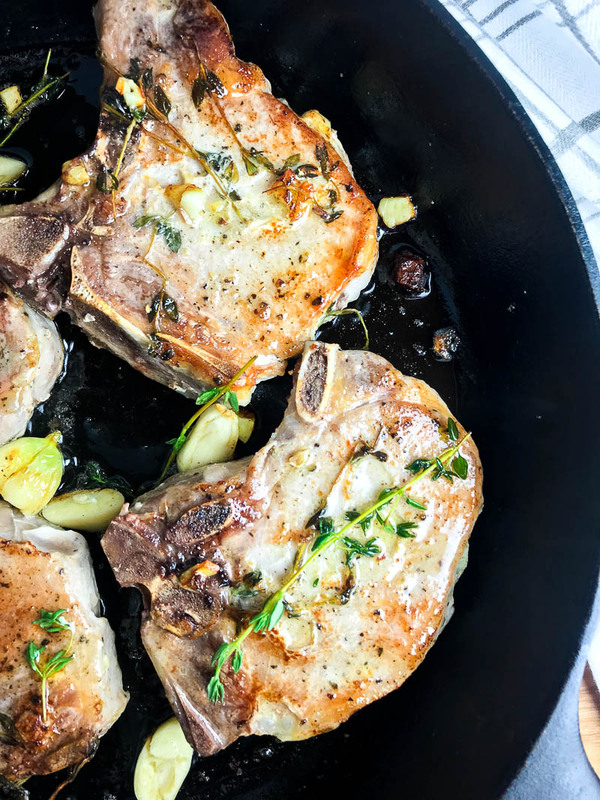 What temperature do you need to cook pork chops? The USDA recommends that pork chops be cooked to 145 degrees. 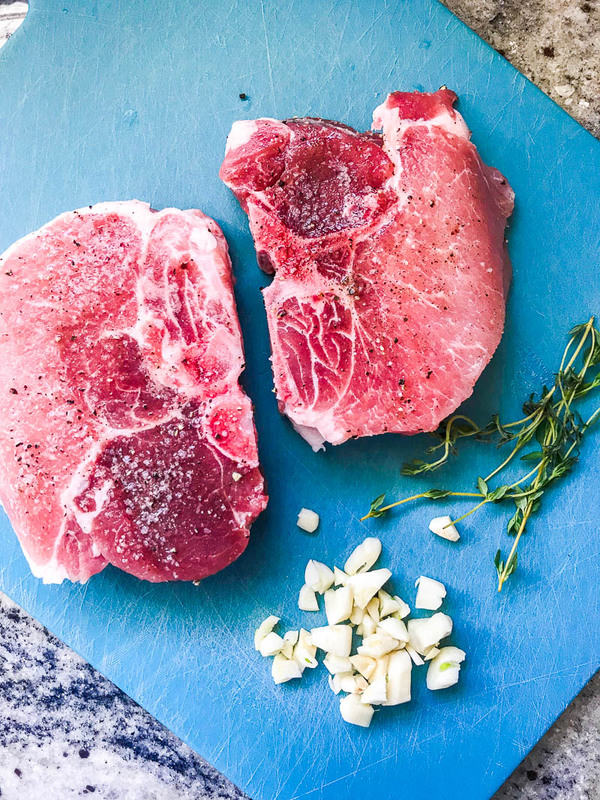 For sous vide pork chops, you’re going to cook them at 140 degrees for 2 hours. You’ll then do a quick sear in a screaming hot skillet and finally let it rest for 3 – 5 minutes before slicing it. All of these things combined will get you to the the proper cooking temperature of 145 degrees. Pork chops are done when they have a blush of pink. Using a meat thermometer also helps ensure you’ve reached the correct temperature. Step one: Season the pork chops liberally with salt and pepper. Place in a ziplock bag along with garlic and thyme. You may need to do two bags so the pork chops don’t overlap. Step two: Set sous vide circulator to 140 degrees for 2 hours. Gently lower the ziplock into the water while closing the top. 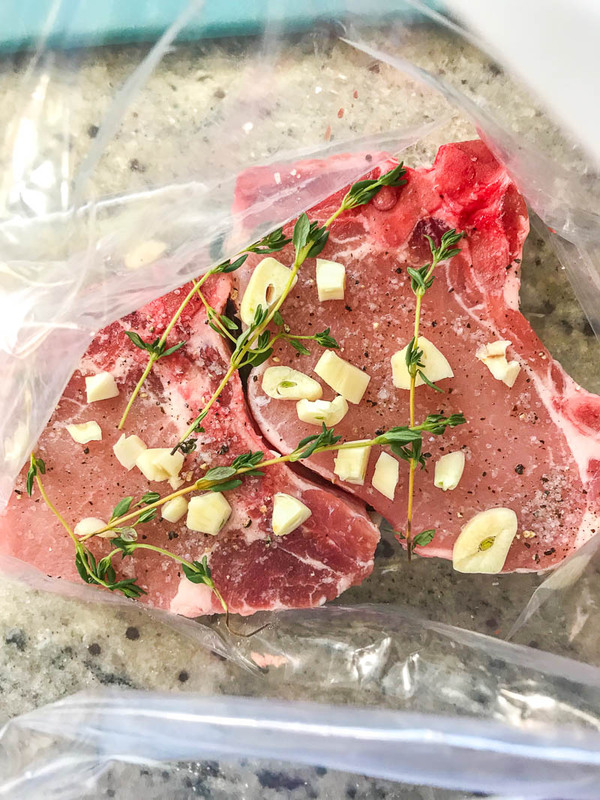 This is the water displacement method which makes it possible to sous vide without a vacuum sealer. Step three: Cook for 2 hours. Step four: Remove from bag, pat dry and sear in a hot skillet with oil, butter, garlic and more thyme. Step five: Allow to rest 3 – 5 minutes. Step six: Eat the juiciest most tender pork chop ever! 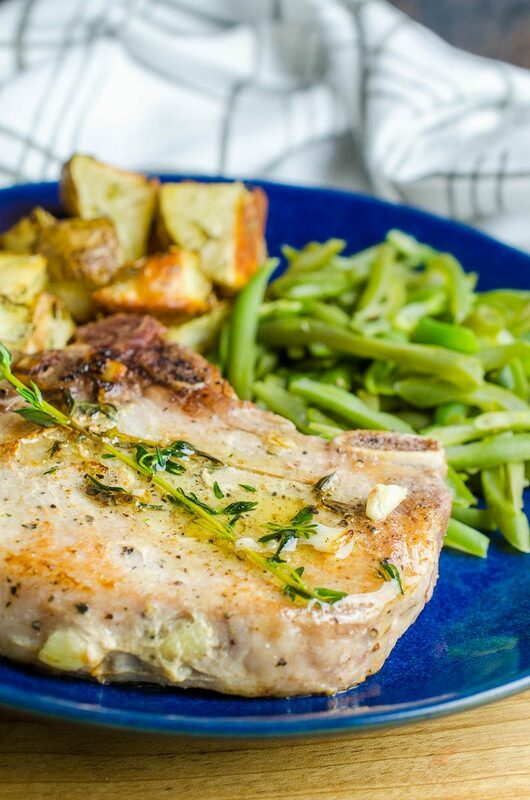 If you’re just getting into the world of sous vide, these pork chops are a great way to try it! And once you do, it’ll be your favorite way to eat pork chops. Trust me. Set sous vide circulator to 140 degrees. Season pork chops liberally with salt and pepper. Place 2 pork chops in a gallon sized bag. Place the other two in another bag. Add three cloves of garlic to each bag. And 2 sprigs of thyme. Slowly lower the pork chops into the water, allowing the water to push the air out. Seal the bags. Ensure that the entire pork chops are submerged in the water. Use a clip to keep the bags close to the side of the pan. Set timer for 2 hours. After two hours, remove pork chops from bag and pat dry. Heat oil and butter in a skillet over hight heat until butter melts. Cook pork 30 seconds on each side. Add in remaining garlic and sprigs of thyme to pan. Transfer to a serving platter and let rest for 10 minutes. 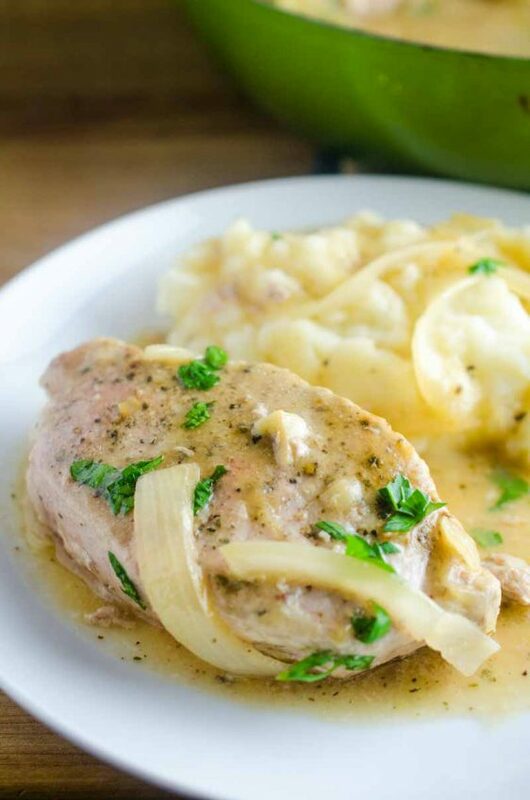 Spoon butter over the top of pork chops and serve.